Sellers are finally starting to list their homes, but inventory remains low because the buyers are snapping them up. 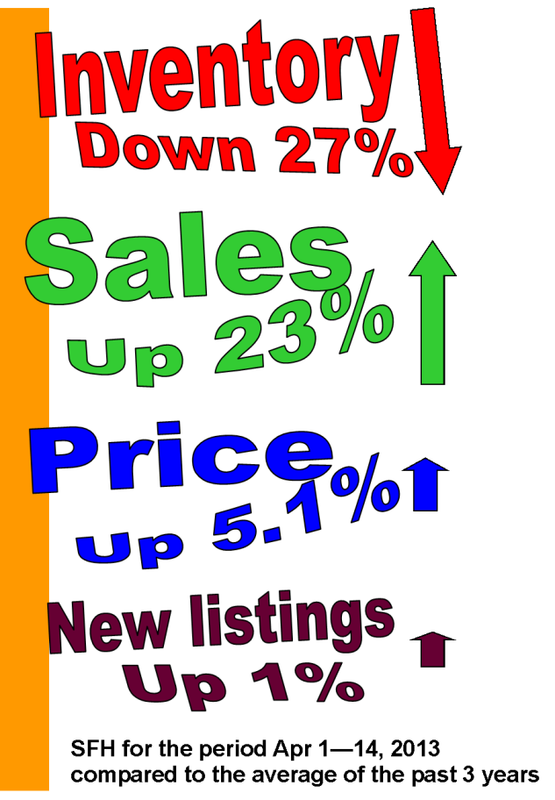 Over the past 3 days, 17% of homes sold for list price or higher. A bi-level in Silver Springs was listed for $475,999 and sold in 5 days for $484,000. It was purchased in 2010 for $417,000. A 2-story in Sundance was listed for $419,900 and had a firm offer in 2 days for $430,000. It was purchased in 2007 for $365,000. This entry was posted in Calgary Herald, Calgary SFH, Market update, Over list price. Bookmark the permalink. In the mean time, the average house has gone up in price by $81,000. I’m sure anyone with any money in the markets noticed the slaughter yesterday of commodity prices, oil included. WTI, is now trading at $87. This was prompted by a mere 0.3 miss in forecast for Chinese growth (7.7% as opposed to 8%). Companies such as Talisman, Suncor and Cenovus lost 4-5% of their stock price across the board. The TSX saw a 300+ point drop on a Chinese miss of 0.3 percent. I still may purchase a place by the end of the year (without a mortgage), but as an investor I see risk everywhere, and you’d have to be pretty blind not to see the risk to Calgary real estate. Calgary house prices are pretty much driven by the Chinese construction industry, and once that bubble bursts , which the Chinese government is trying very hard to deflate, commodity prices are sure to decline. 4 years ago is right after the US meltdown. How about those that bought 5 – 6 years ago? The high average prices are not a totally true indicator here either.You said it yourself that first timers are on the sidelines so higher priced properties are messing up these stats. Thoughts?